Lovely cottage with fireplace and panoramic views in the middle of a hiking area. 4 bedrooms, 2 bathrooms, 8 people for peace-seekers and wanderers. 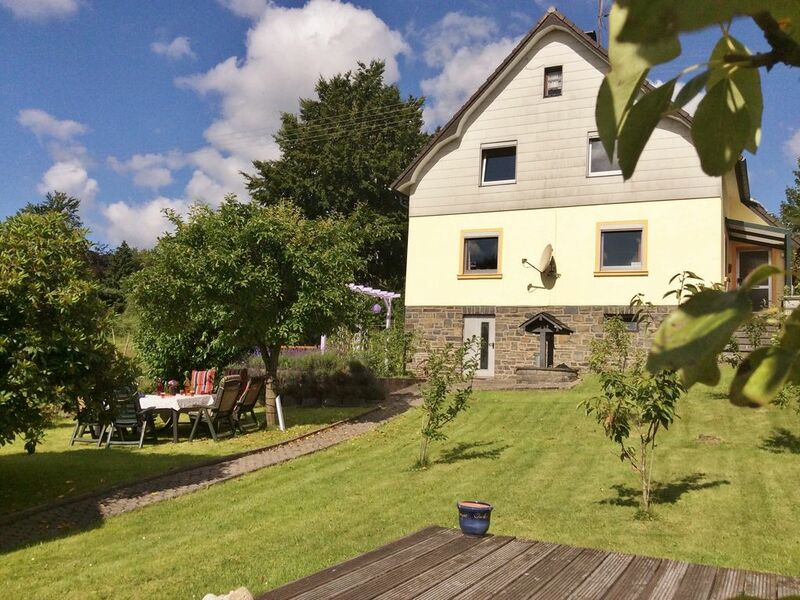 Eifelblick house (living area 180m ² + 600m ² garden) is a beautiful vacation rental house in Monschau-Kalterherberg and has capacity for 8 people. It has 4 bedrooms and 2 bathrooms with shower, bath, wash basin and toilet, a very large and spacious living and dining room with fireplace and flatscreen TV 82 cm (Satellit. with many Dutch and German and English channels), DVD player, board games and books . Fantastic home away from home, comfortably furnished with great fireplace to relax by in the evenings. Kitchen was more than complete with available herbs and spices and all the modern conveniences. We were with 6 adults plus 2 Springer Spaniels and the homestay was more than spacious for us all. Great walks directly from the door through farm lanes to the surrounding forests, beautiful area to explore. Unlimited recommendations! Dear guests, thank you for your good comment. We always are very glad to hear that our guests has had a good holiday in our house. You're always welcome to stay with us again! Das Ferienhaus war für einen gemeinsamen Familienurlaub mit 8 Personen perfekt. Tolle große Zimmer sodass die Aufteilung der Schlafzimmer problemlos funktionierte. Eine Küche , die mit den vorhandenen Utensilien ,Gewürzen und Grundzutaten besser ausgestattet war als zuhause und ein gemütliches Wohn-Esszimmer mit viel Platz für gemeinsame Tage. Vielen Dank für den tollen Aufenthalt! Liebe Ferienhausgäste, herzlichen Dank für die gute Bewertung! Es freut uns immer sehr, wenn unsere Gäste sich wohl gefühlt haben und ein paar schöne Tage bei uns verbringen konnten. Vielen Dank für Ihren Besuch! Wij hebben met ons gezin, 8 volwassenen, een mooi weekend gehad. Het is een prachtig, compleet ingericht huis en ook goed gelegen. We have had a wonderful week in this beautiful house we had everything we needed it was lovely clean and spacious like home from home. The children especially Loved to watch the birds come to eat the nuts from the bird feeder on the window. Lovely garden and garden furniture with fantastic views of the countryside. we would love to return some time and would definitely recommend to a Friend. we used this location as a base for the Belgium Grand Prix as it was only 20 minutes away by car. Een mooi, ruim en zeer compleet vakantiehuis in Kalterherberg. Zelfs de handdoeken werden per kamer verstrekt. We hebben genoten van het huis en ook van de mooie omgeving. Mooie wandelingen gemaakt en een bezoek gebracht aan het prachtige Monschau, waar we ook te voet naar toe konden gaan. Zeer goede ervaring met het huis in Monschau. Niet alleen is de omgeving mooi, maar het huis zelf is ook ruim en van gemakken voorzien zoals elektrische bedden, twee badkamers en een mooi grote eettafel. Prima om een weekend in door te brengen! Our beautiful and comfortable house, with beautiful views, situated in a scenic location in the 'tail Monschauer country' and is immediately adjacent to the nature reserve 'High Fens' in Belgium and at the 'Eifel National Park'. Beachten Sie bitte, dass alle fixen Nebenkosten ( wie Endreinigung, Strom, Bettwäsche, Handtücher, Wasser und Heizung) automatisch mit in der Preis eingerechnet werden. Preise sind bei Belegung mit 2 Personen pro Zimmer. Bei Belegung 1 Person/Zimmer Aufschlag 10,- pro Zimmer pro Nacht.